Frothnflames is a family owned business location in Bayswater North. Here at Frothnflames we make products designed not only for beauty and function but also to be used every day. We believe quality luxury products should be affordable for the everyday person. 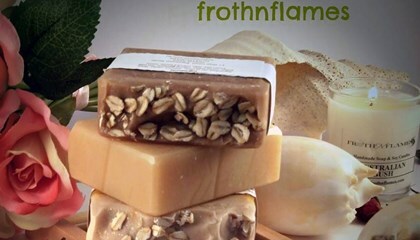 Our luxury Handmade Natural Soaps are made with the finest ingredients. Our Olive Oil comes from Victorian Groves. We try to purchase all our ingredients locally to support local business. Other ingredients you may find in our soaps are but not limited to, coconut oil, shea butter, cocoa butter, hemp seed oil, grape seed oil, avocado oil, natural clays, goat milk, camel milk, oat milk, ground oats, poppy seeds, activated charcoal all chosen for their unique benefits they bring to our products. We have a range of soap with essential oils plus some fun and enticing fragrant oils that are pleasing to the eye as well as being skin loving and gentle to use. Our candles are made from Soy Wax which is biodegradable. Our candles are highly fragranced with the maximum scent load and will give you may hours of burning satisfaction. We have many fragrances to choose from. 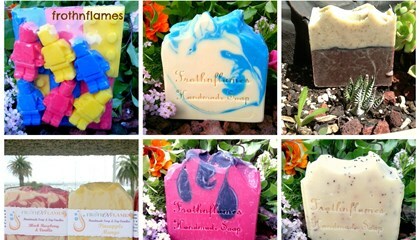 We can design a range of soap or candles for your special occasion. Wholesale and bulk buy enquires welcome. Frothnflames offer a 100% satisfaction guarantee on all our products. Postage available.